U.S. college students have run up $1.4 trillion in student loan debt, but some college majors have apparently prepared borrowers to pay down that debt at a faster rate. CometFi, a resource site for college grads with student loan debt, has drilled down into the student debt numbers over the past decade and unearthed some surprising facts. When it measured student loan debt against fields of study and subsequent careers, the study determined that graduates in journalism and broadcasting have done the best job of paying off their student loans. This group graduated with an average of $27,000 in loans but now owes an average of $12,000, reducing balances by 55 percent. Graduates in publishing, construction, and real estate have all paid off at least 47 percent of their loans. 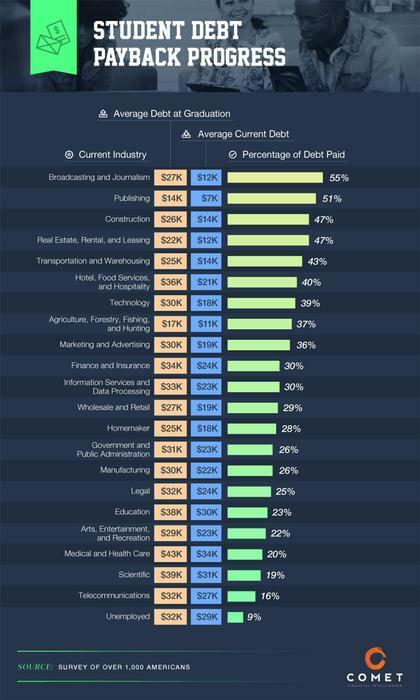 "So why is it that journalists have paid off almost twice as much debt?" the authors ask. "Perhaps it’s because medical professionals were more likely to have other types of debt – business loans to buy into a practice or personal debt incurred during residencies they were simultaneously paying off. Perhaps it’s because people who choose these professions value lifestyles that require more spending, or it may be that medical degrees aren’t quite the financial windfall we think they are." 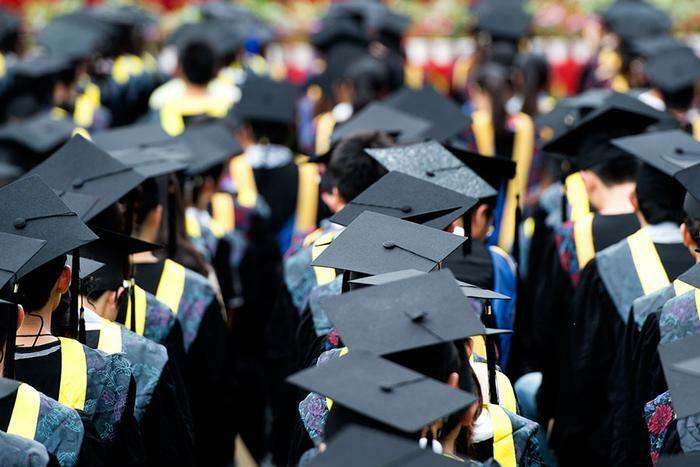 The survey also analyzed students’ financial reliance on parents or family, finding that 51 percent of students paid for their education themselves while 24 percent relied on their parents. It also looked at where students attended school, finding that a large majority -- 57 percent -- attended public, in-state institutions where tuition is typically lowest. Twenty-four percent attended more expensive private schools. However, those attending private colleges graduated with the most debt but have simultaneously done the best job of paying it back, reducing their loan balances by an average 32 percent. Technical and trade school graduates have paid off 30 percent of their loans, barely outstripping 29 percent paid off for public, in-state graduates. Perhaps the most intriguing aspect of the survey involves looking back. Knowing what they now know, graduates were asked to give advice to their younger selves. If they had it to do over, 49 percent of graduates said they would spend the first two years of school at a community college and live at home. Eighteen percent said they actually did that. Fifty percent of graduates said they would choose to attend a less expensive college and only 54 percent agreed that the cost of attending college was worth it. Student debt has had significant economic impact on the generation that has graduated in the last decade, making many major purchases (in particular buying a home) more difficult. Moreover, the weight of student loans has left this group cash-strapped even on a small scale; forty-six percent of respondents said they did not have the cash on hand for a $400 emergency. The survey found a direct correlation between student loan debt and the ability to meet that unexpected expense, with those with the least amount of debt most able to handle it.